Home / Hypocrites / India / Latest Post / Media / Story / Dear New York Times, Why This Visceral Hate For India? Dear New York Times, Why This Visceral Hate For India? 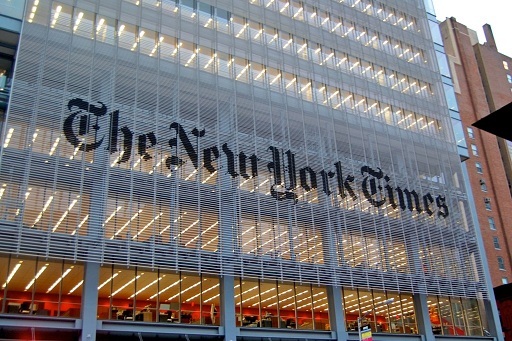 Most of us who enjoy having their regular visage with current affairs must have an idea about ‘The New York Times’. There are lot of guest as well as staff bloggers in NYT from India or of Indian origin. But this is just part of NYT’s Indian association. Those who have followed NYT and their editorial space for some time must have noticed another interesting aspect of this daily. And that aspect is their abject hate towards India. Many of their editorial outputs on India are largely below the belt and most of the times factually incorrect too. Whether it is a concise effort and an editorial policy at NYT to squeeze in something negative about India in every story or they are quite unintentional is no more a guess work. This is not all. Their hate towards India seems to have increased many folds post 2014 general elections. For a large part of the recently concluded USA elections and post the verdict the NYT editorial team seems to have drawn similar warheads against Trump as they did for Narendra Modi. It won’t be surreptitious any more to call them the biggest warehouse of Commie garbage, closely followed by the Washington Post. Time and again they have proved it with their bile and this fact is no more disputable. Coming back to NYT’s hate towards India – from 2014 NYT attracts the regular ‘hate Modi, hate BJP’ gang to go there and relieve their bowls like no other newspaper. Routinely we get to see some known and despicable liberal worth his/her salt, whom I refer as the usual suspects of our home-grown secular colonies, whining out against the current dispensation with hopeless dishonesty, closely bordering with outright lie. They even allow people like Sanjay Jha to bark against the government without mentioning his position as the Congress spokesperson in author’s bio. His political outburst rather passes of as a neutral observation for NYT’s readers. How absurd that becomes on the part of a reputed daily? If not for the core hate BJP intentions, why on earth a newspaper of repute would hide the correct information of its bloggers from its reader base? If distracting its readers to falsehood is not the purpose then I see no reason why a newspaper would lie and continue to associate with liars. 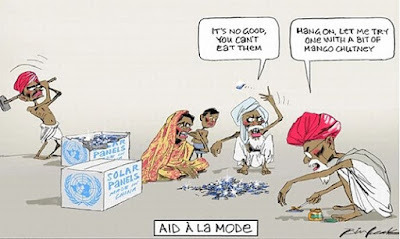 In 2013 NYT came up with an outright deplorable and racist cartoon against India. India’s Mars mission, which the rest of the world later hailed as a remarkable achievement, became a slur generating idiom for NYT. This is what hate does to you. You forgo the basic human qualities in your deeds. Precisely the absent qualities in one that helps identify a rabid Commie in a crowd. For reasons best known to NYT, they felt, space mission is limited to some elite lot and developing nations like India shouldn’t even dream of any such misadventures. This is another trait of Commies. They hate all of that which they feel are inferior to them. Though NYT editor had to apologize for this moronic outlay of a nation, his explanations to cover his newspaper’s rotten track record with bogus reasoning were flabbergasting. It is quite bizarre when he says the intention of the cartoonist was to show that space exploration doesn’t remain an elite affair any more. Really? Nothing more school boyish of an explanation one can expect. Had that been the case, I don’t think the cow fits anywhere to the context. What made NYT to get that cow tucked behind the human figure represented as India, if not for a fact that India is a Hindu majority nation where cow is revered as sacred? This is why I call outhouses like NYT as nothing but herd of liars and cowards. Perhaps they are a gang of hypocrites too but we will discuss their hypocrisy little later. Cleaver escapists they are, they severely lack guts to own up. They usually get away with their crimes but when confronted they lack honesty so much within that they refrain from standing up to their own deeds. This is another typical Commie trait – shoot and scoot and when challenged throw logic to the kitchen sink or worst, start blaming and name calling the entire world. As I mentioned earlier, hate for India increased post 2014. It appears as if NYT as an organization has serious India problem. They allow baseless articles to run on their portal without even doing basic fact checking. During the ‘Dadri’ farce NYT had its foot soldiers running amok with all kind of lies possible. Case in point is the below snippet on the imaginary intolerance that grew exponentially post BJP’s win. You would require a wagon of salt to digest the above quoted lie. But before that, it must be mentioned here that the author of this bile never visited India in her entire life, much less during the said period. But surprisingly she seems to have all the details of the case and situation so much so that she painted the situation almost as grim as in Syria. The author ought to be the modern day 'Sanjay' of Mahabharat fame. Yes the one who could see things in detail yet being far away from the scene of action. Jokes apart, who gave her this info and why it didn’t befall on NYT to do basic fact checking before running this nonsense when they were very well aware that the knowledge of the author isn't first hand? What kind of editorial management is this? The article lacks any truth which is proved from the three instances that the author picked to base her falsification. The author picks the killing of Narendra Dabholkar, Govind Pansare and M. M Kalburgi to degenerate the Modi government. This is how lies are manufactured. Had the author been devoid of her agenda and pathological hate she would have noted or at least studied to get the fact that Dabholkar’s killing happened in 2013 when BJP was not in power; neither in the state nor at the centre. Kalburgi was killed in a Congress ruled state which too the author never cared to check. How such lies could pass the editorial board of NYT? That said, I still give that to NYT. One need not have to crosscheck if the sole idea is to press your hate through bogus whining and NYT allowed the author to do exactly that. Baseless articulation with fact free documentation of events in your favour is another tangible trait of Commies that we are used to. So nothing new in seeing/reading it once more. Though NYT even took shelter of lies to support the inner zest in their ‘Hate India’ mission they remain quite oblivious to similar happenings elsewhere. For my own interest I scanned the entire NYT archive and to my surprise I didn’t find a single, I mean single, article on the Fatwa against Salman Rushdie or Tasleema Nasreen. They didn’t even publish anything condemning the Islamic terrorists for killing some of their very own from ‘Charlie Hebdo’ in France. I didn’t find a single post on Kashmiri Pundit exodus either. How on earth the advocate of free speech and justice like NYT can remain dead silent on issues that otherwise the rest of the world is talking about? The silence should have reasons or else when NYT can weep for only three killings why they would want to remain unmindful towards the ethnic cleansing of an entire race. What could be the reasons or are these signs of liars and hypocrites, true to the symptoms of every Commie on this planet? NYT’s hate for India is not bound to just one or two instances. There are plenty of them. Post Narendra Modi’s assertions of India aiming at becoming the global power in renewable energy, specifically on solar energy in future, NYT came up with another of their rot. This time mocking the poor or may be the illiterate or may be the entire nation again. What sense this caricature makes is beyond me. What was the message that NYT wanted to pass on here if hate for India isn’t the one? Someone eating solar panels with Mango Chutney is as disgraceful as it can get. What were the specific ideas behind such a drawing? Is it that India is full with illiterates and retards to not even differentiate between food and solar panels? Or is it that India has so much starved population that they would end up eating solar panels out of acute hunger? What kind of a moron can even conceive such puke worthy graffiti? It is simply unimaginable coming from a reputed daily. But then, didn’t I say, Commies hate and downgrade whatever they feel is lower to them? Their whole existence depends on the objectification of their hate. They simply can’t tolerate anyone rising up in his/her life. And yet they would be the first to write in lengths about intolerance and social justice. NYT also engages routine ‘Hate Modi’ campaigners from India to further their mission. I gave the example of Sanjay Jha but it is not Jha alone. There are infact in dozens from India who just do mindless slandering 24X7. Hate filled posts by our intellectual ‘Desi’ appears quite regularly on their portal. The who’s-who of India, the ones that made their career by simply abusing one man from 2002, feature in their author list. One such charlatan is Pankaj Mishra. He has many rubbish to his credit but I am just picking one. Honestly, picking one of Mishra’s bile would suffice as the pattern and hate remains consistent in all of his posts. This is what he wrote after 2016 USA elections and the gullible NYT ran it for a month. Not to forget, there were no fact checking done here either. I am sure Mishra doesn’t have an iota of clue on what alt-right means, much less his knowledge on BJP or RSS. The language getting to gutter level only makes his intentions without any reason more prominent. Not sure of the stink that Mishra here is harping on but for sure the only stink that is emanating is of Mishra’s liberal hate and the pathological hate of NYT towards India, BJP and Modi. For a major part of an hour I was scampering for reasons on how an international Newspaper can allow such language be furnished in their editorial section. I guess, it was allowed because it fits to another spectacular trait of the Commies. They are the most abusive lot one can find but they would be the ones accusing everyone else being abusive. We see this trait quite often in India. We have street thugs to category 5 morons; we have the ever evolver too. And the basic string that stitches them together is that all of them are abusive at the slightest instance. Of course another quality that is common is their ability to play victim when countered with facts. 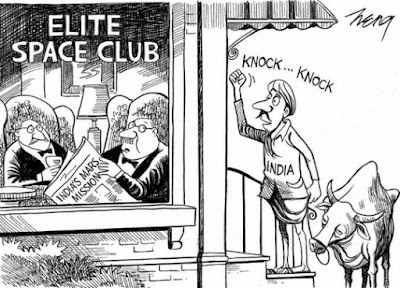 Even the latest 104 number world record satellite launch by India didn’t go unhindered from NYT’s muck. In an article published yesterday NYT was busy slandering the people of India than holistically analysing this latest space achievement. It was both annoying and hilarious at the same time. When the rest of the world was talking about the success story NYT was busy dissecting the Indian psyche and how Indians are fascinated with world records. This is what journalism has come to being addressed at NYT. And what is so baffling for NYT with the celebration among Indians after the satellite launch? Perhaps the problem lies with another common Commie trait. They simply can’t tolerate the success and joy of others. Somehow they become desperate to find avenues to mock and here NYT precisely did that. Note the highlighted block in red. One reading the article with no idea on India would imagine Alok Kumar Dubey to be a prominent public figure, so much so to be exampled alongside the president and the PM of the republic. But poor Mr. Dubey is far from being one. The Twitter handle NYT referred has only 100 odd followers but yet it is the sheer brilliance of NYT to encircle Dubey Ji as one of those right wing chaps. More even, for NYT, an individual’s opinion becomes that of the nation. But I agree here that NYT remains stuck to their ‘one equals to all’ theorem. After all a single ‘Dadri’ made entire India intolerant. That said, this cherry-picking of an average Indian to mock an entire nation leads to a very fundamental question – why only the RW folks would celebrate the success of the nation? Why not the Left Wing thugs be celebrating equally? If this is not the case then how NYT was sure of Mr. Dubey’s political alignment? I can go on and on but that would make this post never ending. Hope we take note of the junks like NYT and the morons therein for our own good. They are liars, hypocrites, opportunists and most important, Commie pigs.